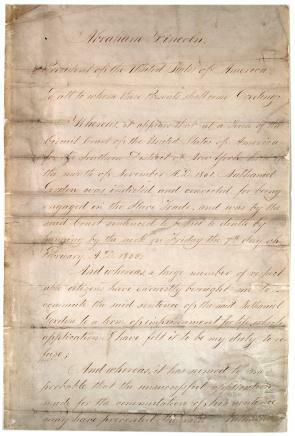 This stunning document, a refusal of clemency for a convicted slave trader, stands out among the papers of Abraham Lincoln, a man renowned for his mercy and willingness to pardon. In November 1861, Nathaniel Gordon was convicted of slave trading and sentenced to hang. Participation in the slave trade had been punishable by death since 1820, but Gordon was the first man to be executed for the crime. Between 1837 and 1860, seventy-four cases relating to the slave trade had been tried in the United States, but very few men were convicted, and even then they received only light sentences. Only one other slave trader had been sentenced to death, but he received a full pardon from President James Buchanan in 1857. Gordon’s friends and supporters approached Lincoln, as the President wrote, "to commute the said sentence of the said Nathaniel Gordon to a term of imprisonment for life." Lincoln declined, writing that it was his "duty to refuse." He did, however, delay the execution for two weeks, to allow the prisoner time to make "the necessary preparation for the awful change which awaits him." Lincoln’s unwavering refusal to grant Gordon clemency is a testament to his intolerance of slavery. At noon on February 21, 1862, Nathaniel Gordon was brought to the gallows in New York City. Both the death warrant and Lincoln’s refusal to commute the sentence were read aloud, and then he was hanged. The article from Harper’s Weekly attached as a pdf describes the case, Gordon’s attempted suicide, and the execution. Within a year of Gordon’s execution multiple anti-slavery measures were enacted, including the abolition of slavery in Washington, DC, the Second Confiscation Act, and the Emancipation Proclamation. A full transcript of Lincoln’s letter is available. A full transcript of the Harper’s Weekly article is available. Now, therefore, be it known, that I, Abraham Lincoln, President of the United States of America have granted and do hereby grant unto him, the said Nathaniel Gordon, a respite of the above recited sentence, until Friday the twenty first day of February, A.D. 1862, between the hours of twelve o’clock at noon and three o’clock in the afternoon of the said day, when the said sentence shall be executed. In testimony whereof, I have hereunto signed my name and caused the Seal of the United States to be affixed. Done at the City of Washington, this Fourth day of February A.D. 1862, and of the Independence of the United States the Eighty-sixth. Explain the pressures that were placed on President Lincoln to commute the sentence of Nathaniel Gordon. If Lincoln had chosen to further explain his reasons, what might he have offered as to why he found it his “duty to refuse” the appeal for clemency? How did the execution of Nathaniel Gordon illustrate the evolution of Lincoln’s attitude toward the slave trade? To what extent did the dates of the seizure and trial of Gordon play a significant role in his conviction, sentencing, and execution? Why did Harper’s Weekly so graphically describe Gordon’s attempted suicide and his eventual execution?